River rocks have a special beauty because their surface has been smoothed over time by the movement of water. The definition of a river rock is any type of rock—granite, basalt, schist etc.—that has been worn by water, whether river or seawater. At MDI Rock, we carry stones gathered locally from the bed of the Salt River. 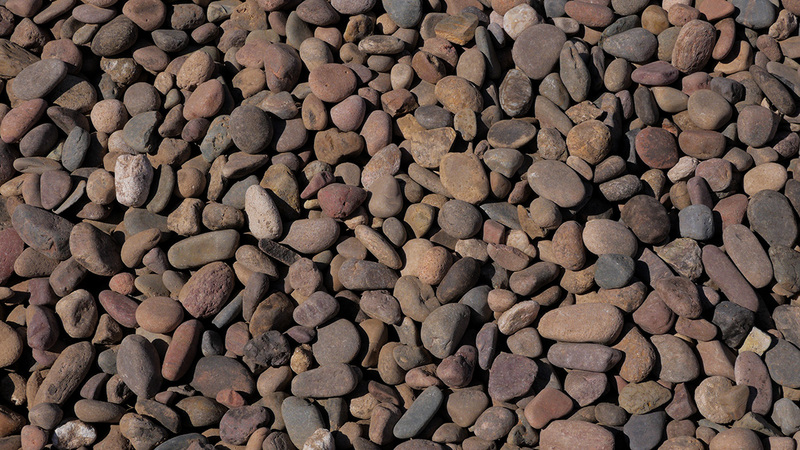 These rocks, which come in beautiful hues of pink and gray, can be used in a multitude of landscaping projects. Here are seven ideas to try. Outdoor fireplace. Use mortar to build an outdoor fireplace that can be an attractive gathering place for family and friends in cool Arizona months. Walkway. River rocks can add interest to a walkway made up of large smooth flagstones or pavers. Or if you use small enough river rocks, they can be walked on comfortably themselves. If you have grass nearby, you’ll want to contain your stones with border material so they don’t find their way into the lawnmower blades. Dry river bed. River rocks look nice arranged as a faux dry river bed in your landscape. You can be creative and let your “river bed” meander around trees and plants as water would flow naturally. Fountain or waterfalls. River rocks look even more beautiful when they’re wet. It goes without saying that these are the perfect stones to incorporate into water features in your landscape. Mulch for plants. The clean smooth surface of river rocks helps keep weeds down and makes a nice background for our beautiful desert plants. A column or fencing. Fill a wire cage with river rock to create a small section of decorative fencing. Or mortar them together into a column for visual interest, then place a plant at the top. Colorful children’s corner. Have your kids or grandkids turn a few of the smooth rocks into art. You can find fun ideas online for painting rocks to look like turtles, birds, butterflies, and more. These painted critters can then live in a backyard bed of plants and unpainted stones. We’re sure you can think of even more ways to use these lovely rocks to create your perfect landscape.